During the first week of August 2002, we were staying at the Healing Center in Sedona, AZ (wonderful place, worth a visit!). One evening after dinner, I happened to look at the wall behind one of my fellow-travellers and noticed this weird looking animal on the wall. 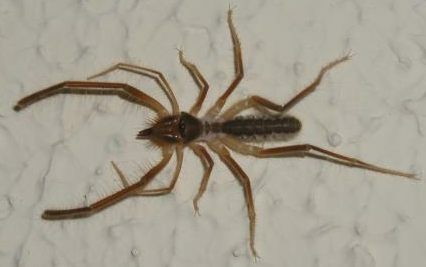 It was about 10cm in length (body about 5cm) and looked like a spider. When I counted its legs however, I ended up with the number 10! (well, I counted 9 originally, but that was because I didn't look closely enough). Note that these pictures are actually scaled down. The originals have a much higher resolution. After taking the pictures I gently caught the animal in a glass and released it outside. When I came back from holiday, I searched the web high and low for any information about this animal. Unfortunately, I was looking for spiders, and as it turns out, this is not a spider at all. 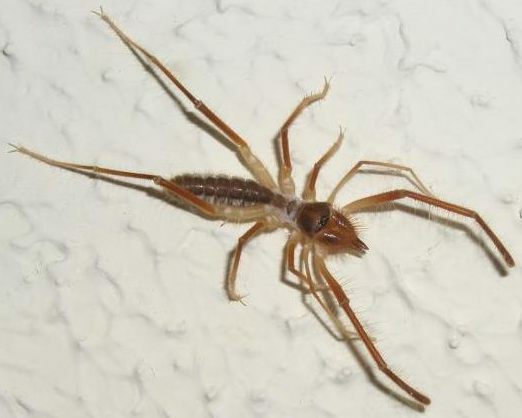 Through a friend of mine (thanks Davide), I got in touch with Piero Fariselli from Bologna, who immediately recognised the animal as a specimen of the solpugidae, also known as ‘sunspider’ or ‘wind-scorpion’. He seemed quite envious of me for finding such a nice specimen. He and his friend Cesare spent three weeks on Sardegna looking for this animal in vain. Piero and Cesare have a huge collection of arthropod (among others) pictures, see http://space.tin.it/scienza/cebrizio/diapoeng.htm. The sunspider is a funny little creature. 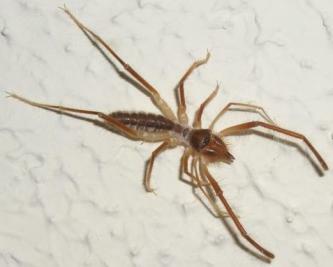 It has huge palps, which it uses to grab its prey and transfer it to its large jaws to tear it to pieces. It has to take this rough approach since it is not venomous. It can bite humans when handled, but the bite is not harmful.